'80 Years At The Fortrose' - the Dinner Dance organised by the S. Thomas' Prep School Old Boys' Union takes place on Saturday the 30th of June, 2018 at The Grand Ballroom, Colombo Hilton. '80 Years At The Fortrose' is a celebration of the 80th Anniversary of the School which saw the restoration of ‘Fortrose’ - the building in which the School was founded in. Cocktails will be from 8PM to 9PM at which time the doors to the Ballroom will open and guests will be transported to Fortrose. A delectable Dinner menu complete with Sushi, Carveries and Action Stations will be followed by a sumptuous Breakfast. Every table will have a bottle of Single Malt, Premium Vodka and Wine. Two of the hottest bands in town, ‘Black’ and ‘Wildfire’ will be in attendance and will be complemented by the vocal talent of renowned singers Rukshan Perera and Romaine Willis. Old Boy, Pasan ‘Nitharama Suffering’ Ranaweera, will be the Master of Ceremonies. The music and dancing will continue till morning and will only be interrupted to hand out exciting raffle draw and competition prizes which include Return Air Tickets, Weekend Hotel Stays with transport to and from your house in a Land Rover, Household Appliances, Jewellery & many more. Work on the reconstruction of Prep School commenced on the 12th of December, 2017. We are extremely grateful to Mr. Jayaseelan Gnanam of Rhino Roofing Products Ltd. for the donation of roofing sheets. A productive discussion on the progress and plans for the reconstruction of the School with the participation of the Headmaster, the lead Architect, Office Bearers of the Old Boys’ Union (OBU) and Old Boys was held on the 14th of December, 2017 at 6.30PM. We thank everyone who attended and shared their views. Notice is hereby given in terms of Rule 4(a) of the OBU Rules that the 36th Annual General Meeting (AGM) of the S. Thomas’ Preparatory School Old Boys’ Union (OBU) will be held on Friday 7th July, 2017 at 6.30 PM in the School Hall followed by the traditional Headmaster’s Dinner. All duly enrolled members (please bring your membership card/number) are invited. A. Rule 5(a) - Nominations of members seeking election to the posts set out in Rules 5(a)(ii), 5(a)(iii)(a), 5(a)(iii)(b), 5(a)(iv)(a), 5(a)(iv)(b) and 5(c) should reach the Honorary Secretary under sealed cover to S. THOMAS’ PREPARATORY SCHOOL OLD BOYS’ UNION, No. 98, Steuart Place, Colombo 03 no later than 12 noon of Friday 23rd June, 2017 and must include the candidate’s name in full, OBU membership number, position nominated to, consent to fill the position nominated to, names, signatures and OBU membership numbers of the OBU member proposing and seconding and current contact details (See website of the OBU www.prepobu.lk for a Specimen). iii. as Treasurer unless he possesses a recognised qualification in the field of accounting. C.	Rule 4(c) – Notice of any motions to be tabled must be by due notice given which should reach the Honorary Secretary under sealed cover to S. THOMAS’ PREPARATORY SCHOOL OLD BOYS’ UNION, No. 98, Steuart Place, Colombo 03 no later than no later than 12 noon on Friday 16th June, 2017. D.	Headmaster’s Dinner – Members wishing to attend the Headmaster’s Dinner following the AGM must confirm their attendance at the School Office (0112-323976) no later than 1.30 PM of Friday 30th June, 2017. Customarily, for catering purposes, only those with confirmed attendance will be invited to dinner. "…The Lord is my Shepherd…"
Please join the group and invite other Old boys that you know. We value your participation in our activities and look forward to your continuous feedback. Notice is hereby given in terms of Rule 4(a) of the OBU Rules that the 35th Annual General Meeting (AGM) of the S. Thomas’ Preparatory School Old Boys’ Union (OBU) will be held on Friday 29th July, 2016 at 6.30 PM in the School Hall followed by the traditional Headmaster’s Dinner. All duly enrolled members (please bring your membership card/number) are invited. A. Rule 5(a) - Nominations of members seeking election to the posts set out in Rules 5(a)(ii), 5(a)(iii)(a), 5(a)(iii)(b), 5(a)(iv)(a), 5(a)(iv)(b) and 5(c) should reach the Honorary Secretary under sealed cover to S. THOMAS’ PREPARATORY SCHOOL OLD BOYS’ UNION, No. 98, Steuart Place, Colombo 03 no later than 12 PM of Friday 15th July, 2016 and must include the candidate’s name in full, OBU membership number, position nominated to, consent to fill the position nominated to, names, signatures and OBU membership numbers of the OBU member proposing and seconding (See website of the OBU www.prepobu.lk for a Specimen). B. Rule 4(c) – Notice of any motions to be tabled must be by due notice given which should reach the Honorary Secretary under sealed cover to S. THOMAS’ PREPARATORY SCHOOL OLD BOYS’ UNION, No. 98, Steuart Place, Colombo 03 no later than no later than 12 PM on Friday 8th July, 2016. C.	Headmaster’s Dinner – Members wishing to attend the Headmaster’s Dinner following the AGM must confirm their attendance at the School Office (0112-323976) no later than 1.30 PM of Friday 22nd July, 2016. Customarily, for catering purposes, only those with confirmed attendance will be invited to dinner. Mr. B. A. J. Perera, who has taught many of us and who has been the OBU's Staff Co-ordinator for many years now, is retiring from the School's Tutorial Staff after 35 years of Service.The School is organising a special assembly on the 29th of April 2016 to recognise Mr. B. A. J. Perera for his service to the school.It will be good if as many of us could be present to wish him well on Friday the 29th of April at 8 AM at the school Hall. 16 year old Kavindra Nugawela, a student of S Thomas' Preparatory School Kollupitiya has been selected to represent Sri Lanka in swimming at the South Asian Games 2016 which will be held in Guwahati, Assam, India from the 6th to the 16th February 2016. He is the youngest member of the 9 member Mens' National Swimming Team which will represent Sri Lanka at SAG. At the selection trial held from 27th to the 31st December 2015, he was selected for the 200M Back Stroke event. He is being coached by Mr Manoj Abeysinghe of Killer Whale Aquatic Club. Kavindra represented the school at the 42nd Sri Lanka Schools Aquatic Sports Association Swimming Championships 2015 in Boys Under 15 category and was placed 1st in 200M Back Stroke, 1st in 200M Free Style and 1st in 400M Free Style establishing a new Meet Record. Overall in Boys Under 15 category he was placed 2nd at this meet. At the National Age Group Swimming Championships 2015 in Boys Under 17 category he was placed 1st in 200M Free Style, 2nd in 200M Back Stroke and 1st in 400M Free Style establishing a new Meet Record. Kavindra represented the Killer Whale Aquatic Club at the National Aquatic Championships 2015 (Long Course) and was placed 2nd in 200M Free Style, 2nd in 200M Back Stroke and 2nd in 400M Free Style in open Mens category. At the same meet he was a member of the Killer Whale Aquatic Club Relay team which established new National Meet Records in 200M, 400M and 800M Free Style Relays. He was selected to represent Sri Lanka at the Asian Age Group Meet held in Thailand in November 2015. The OBU of S. Thomas' Preparatory School, Kollupitiya has a membership of over 1850 and rapidly increasing in number with the online process implemented. We wish to fill the above vacancy with a self-starter who is able to work independently and maintain the daily operations of the OBU office. The ideal candidate should be a school leaver, having completed his Advanced Level Examinations. Preference will be given to a past Prepite / Thomian. This position requires the performance of secretarial support duties to the Executive Committee and managing the operations of the OBU office including the maintenance of the accounts, general filing system and membership records under minimum supervision; thus integrity will definitely be evaluated. Candidates are requested to forward their applications BY EMAIL ONLY to the following address on or before 20th December 2015. It gives me great pleasure to extend a cordial invite to all of you to join the PREP SCHOOL contingent of this walk organized by the Old Boys’ Association (OBA) of S. Thomas’ College Mt. Lavinia, which, I am reliably informed, is fast gathering momentum with the enthusiastic participation of Old Boys, Students, Parents, Teachers and Well Wishers; not only from STC Mt. Lavinia but from all others of the fraternity. The Warden has kindly extended an invitation for us to join in and also use this occasion for us to raise funds for the much needed development activities at Prep School, for which collection cards are available at the Prep School Office. The Walk is scheduled for Saturday 7th November 2015, due to commence at the Havelock Sports Club Grounds around 3.00 p.m., with participants requested to line up between 1.00-2.45 p.m., and will wind its way through Galle Road to the ‘School by the Sea’ at Mount Lavinia. The Organizers anticipate the route along which the Walk is due to proceed to be virtually painted in Blue & Black. A typical ‘Cycle Parade’ atmosphere will prevail along the way with the inclusion of floats, double decker buses and open hood vehicles carrying live bands as well as papare bands. It is expected to conclude at the ‘Big Club’ grounds, where a ‘Hawker Street’ Food Festival is being organized by the Parents-Teachers Association (PTA) of STC. There will be unlimited entertainment for the participants, including live band performances and other attractive attractions such as fun rides and bouncing castles typically found in carnivals. I look forward to walking with you and the others this Saturday, accompanying our own Headmaster, staff, and students as we make up the numbers of our own little ‘Thomian Home by the Roaring Billows’. Notice is hereby given in terms of Rule 4(a) of the OBU rules that the 34th Annual General Meeting of the S. Thomas’ Preparatory School Old Boys’ Union will be held on Friday 5th June 2015 at 6.30 p.m. in the School Hall followed by the traditional Headmaster’s Dinner. All duly enrolled members (please bring your membership card/number) are invited. 10. Amendments to Rules 4(e) (financial period), 5(c) (age group “A”), and reinvestment of OBU Trust Funds – details at http://www.prepobu.lk, e-mailed and posted with notice. 1. Rule 5 (a) - Nominations of members seeking election should reach the Honorary Secretary under sealed cover at the above address no later than 12 noon of Friday 22nd May 2015 and must include candidate’s name in full, OBU membership number and consent to fill the position nominated, names, signatures and OBU membership numbers of those proposing & seconding. 2. Rule 4 (c) – Notice of any motions to be tabled must be by due notice given and received, which should reach the Honorary Secretary in writing at the above address no later than 12 noon of Friday 15th May 2015. 3. Rule 10 & 4 (c) – The Executive Committee proposes to amend Rule 4(e) (financial period), Rule 5(c) (age group “A”), and reinvestment of the OBU Trust Funds, details of which are available online at http://www.prepobu.lk, e-mailed, and posted to all members on the database. 4. Headmaster’s Dinner – Members wishing to attend the Headmaster’s Dinner following the AGM must confirm with Mrs. Kusum De Silva at the School Office (Tel. 0112-323976) no later than 1.30 p.m. of Friday 29th May. Customarily, for catering purposes, only those with confirmed attendance will be invited to dinner. Please be placed on notice that acting under Rule 9(a) of the OBU Rules in force, the Executive Committee has resolved to summon a Special General Meeting of the OBU on Friday the 28th of November, 2014, at 6.30 p.m. The venue for the meeting will be the auditorium of "Kithu Sevana," Bauddhaloka Mw., Colombo 7 (adjacent to the Cathedral of Christ the Living Saviour premises). (as circulated via e-mail and web page). Further to the e mail that went out yesterday to the general membership of our plans for the 17th evening to celebrate our beloved schools 75th anniversary , we have organized a social for all members of the OBU and their spouse. The event will be at the Orient Club at Col 07 and will commence around 7.30pm . Some light music has been arranged to entertain all attendees. Catering will be by way of an eastern dinner menu, comprising of Hoppers/ Kottu / String hopper pillau along with the usual curries. The cost will be 1000/- per head. A bar counter will be in operation for those who would like to purchase any beverages. If anyone wishes to bring their own liquor , corkage will be 250/- per bottle. Please do pass on this message to all your class mates and acquaintances from Prep. Please click on the link below to download the minutes of the Special General Meeting of the OBU of S. Thomas' Prep School, held on 24th April 2013. It behoves me in my capacity as your elected Secretary, to extend a BIG THANK YOU to all of you, from the very bottom of my heart; for giving of your time & resources UN-HESITATINGLY to make PREP NITE 2013 ("Seventy Five") yet another resounding success - THANK YOU!!! To all those Old Boys who supported in your numerous ways, be it by way of sponsorships, gifts or outright donations, or simply buying out all the tickets long before the event; I say THANK YOU; to all our well-wishers and the wider Thomian community that participated or sponsored us, I say THANK YOU; the Lord Bishop of Colombo who is the Chairman of our governing body for being there with us, I say THANK YOU; for those hardworking members of this year's Ex Co who made up the Organizing Committee for this our GRAND 75th ANNIVERSARY CELEBRATION, who made sure from the very first lyrics of the school song to the final "maalu paan" served at the break of sunlight... I have no words to express my gratitude, so I will simply say THANK YOU! Just like last year (or better – by the comments received thus far), it was once again a perfectly planned, clinically executed all round team effort; we’ve been receiving nothing but COMPLIMENTS and that makes me proud to once again have worked in such a DYNAMIC TEAM; for those of you that missed being part of this 75th anniversary celebration in some little way at least; let me simply state that you missed a darn good show and a great opportunity of being part of making history for our dear old “home by the roaring billows – for the lives that lies before us”! My parting "charge" to particularly those younger Prepites who we’ve been fortunate enough to discover and groom over these last couple of years - PREP SCHOOL is truly blessed with your youthful energy; now BUILD ON what you began and put up an even BIGGER show next year and take it to greater heights targeting the centenary celebrations in 2038; I for one (if we’re still around alive & kicking), will be the proudest & the happiest to see that! WELL DONE ALL - I remain, truly a benefitted man and a deeply fulfilled Secretary from your dedication to the task and the experience of having been there with you. Our Prep School maths and science teacher Mr. P. Ramanayake's wife has been urgently advised to undergo a kidney transplant as she has been diagnosed with end-stage renal disease. She is currently under the care of Dr. Surjit Somiah, consultant nephrologist at Lanka Hospitals. A letter from Dr. Somiah is attached. The doctor has advised that an individual of blood group A +/- or O+/- would do, and he or she should not be having blood sugar or pressure related complications in order to qualify for further tests/investigations as a potential donor. Should you be able to assist in any way, please contact Mr. Ramanayake on 011-2764076 or 0725-935417. Please click here to download the Medical Report for more information. We regret to announce the demise of Mr. O.N. Peiris (Nihal Peiris), who served on the Prep School staff from 1978 until his retirement in the mid 2000s. In addition to teaching and other school activities, Mr. Nihal Peiris was actively involved with the Prep School cricket teams throughout the 1990s, and also coached the senior team. He was the Deputy Headmaster at the time of retirement. His mortal remains will lie at his residence, No. 59 Rawatawatta (past the Sarvodaya), after which the cortege will be brought to the Methodist Church, Rawatawatta at 4 p.m. tomorrow. Burial will be at Moratumulla Methodist Church after the service. Bookings for Tables in multiples of 10 are now open. Please send us your name and contacts so that we can reserve a table for you. Tickets are NOW AVAILABLE for sale for the informal get together at the 80 Club on the 25th of August. Please find more details on the ticket sales in the attached image, as tickets will not be sold at the gate. This informal social evening will enable us to "kick-off" our year's activities, to meet and discuss matters of Prep School in general and this year's programmes in particular in lighter hearted social environs; so that you may also contribute with the invaluable feedback that we constantly receive from our members, towards preserving and promoting our dear Prep School for the benefit of future generations of Prepites in the years to come. Please feel free to circulate this to other Prepites that you may be in contact with, ideally with a Cc to the OBU at prepobu [at] gmail [dot] com and prepobu.admn [at] gmail [dot] com; so that we may also update our records. We look forward to seeing as many of you there, as possible! Below are the details of the Service of Thanksgiving to be held in memory of Mr Vernon Weerasinghe, who passed away on 17th May 2012. Mr Weerasinghe joined the staff of S. Thomas' Prep School in 1981, after retiring as Principal of Carey College, and was later appointed Deputy Headmaster under Mr. J.S.L. Fernando. He retired as Deputy Headmaster in 1998, but continued as a part-time English and Geography teacher at Prep until 2003. S Thomas Prep Under 15 beat St Benedicts, Kotahena in their Schools Under 15 Div II fixture played yesterday at the Health Grounds Borella. S Thomas Prep 177/6 in 39 overs. St Benedicts all out for 73 all out in 28 overs. S Thomas Prep Under 15, beat Royal College "B team" by 41 runs, in their opening match of the Under 15 Division II tournament match played yesterday, at Royal College Junior Grounds, Colombo 7. Click here to view the Secretary's report that was tabled at the meeting. Narrated by the alcoholic former sports journalist WG Karunasena, the novel is the story of his quest for Pradeep Mathew, a devastatingly talented Sri Lankan spin bowler who appears to have been expunged from historical record. Despite its cricket focus, Karunatilaka promises in the book: "If you've never seen a cricket match; if you have and it has made you snore; if you can't understand why anyone would watch, let alone obsess over this dull game, then this is the book for you." Judges of the £10,000 prize agreed. "This fabulously enjoyable read will keep you entertained and rooting for the protagonist until the very end, while delivering startling truths about cricket and about Sri Lanka," said chair Margaret Busby. "It's an insightful story about fact and gullibility, about world history, about friends and family [and it] sets the standard high for the new Commonwealth book prize." The award, won in the past by Peter Carey, Christos Tsiolkas and Aminatta Forna, has been relaunched this year by the Commonwealth Foundation's Commonwealth writers' programme to target and identify new talent, and goes to a first novel. 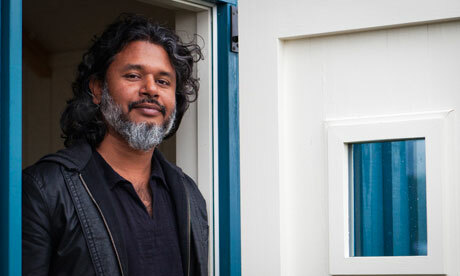 Karunatilaka beat names including Ondaatje winner Rahul Bhattacharya to take the prize, which was presented at the Hay festival on Friday afternoon by the award-winning Nigerian author Chimamanda Ngozi Adichie. Speaking to the Guardian, Karunatilaka said it was a "huge surprise" to win – although the fact that the Sri Lankan cricket team lost to Pakistan on Thursday had made him quietly positive, he joked. "Whenever the Sri Lankan cricket team loses, something good happens to the book, so as they got thrashed last night I was pretty confident," he said. "Winning the prize means so much … If you are a Sri Lankan writing in English you can't expect to be published outside Sri Lanka. When I finished it, I thought it would be appealing to Sri Lankans, and perhaps readers in India and Pakistan and the subcontinent would get into it, but I really didn't think it would go further than that … I was surprised to make it to the final five, considering how strong the Asia shortlist was. To win it is quite crazy. Now I just need to find a pub in Wales that serves arrack." Chinaman – the title is a reference to a particular bowling delivery in cricket – has already received glowing reviews in the UK. Nicholas Lezard wrote in the Guardian: "I can hardly believe this is a first novel by someone self-described as a bass-player and advertising copywriter, the dumbest jobs in music and writing. He has with no apparent effort got into the mind of an articulate, wise, but despairing and cynical drunken old hack, and this long, languorous and winding novel has registers of tragedy, farce, laugh-out-loud humour and great grace". The author said he spent two years doing "nothing but watch cricket" as research for the novel. "Research is what derails a book, but all I had to do was watch cricket and hang out with drunk old men, so that wasn't too strenuous. I wanted to be authentic to the voice, which was why I did a lot of talking with these characters, these old men obsessed with cricket who would spend all day drinking," he said. Karunatilaka is now writing his second novel – not about cricket, but also set in Sri Lanka. "I'm steering clear of drinking and sport, but it will be in Sri Lanka," he said. "I do feel quite lucky because Sri Lanka is not very well trodden ground [for authors] and there are so many stories around." The £5,000 Commonwealth short story prize was won by New Zealand author Emma Martin for Two Girls in a Boat, which chair of judges Bernardine Evaristo described as "gorgeous, elegant and spare". The story was chosen, she said for "its nuanced handling of time, place and relationships; its daring, provocative subject matter and clear-eyed exploration of the choice of heterosexual conformity in the face of sexual mutability. Until we had decided on our shortlist, all entries were anonymous. So it is also great that this prize, I think we can claim, has discovered Emma Martin, who has not yet published a book, and brought her to an international audience. With her considerable talent we hope to see more of her work in the future."